Flowers inspire us. They help us celebrate our lives with gratitude for nature's generosity. Whether you want a bucket of blooms or a weekly bouquet, we want to help you fill your life with color and joy. At Fireside Farm, we grow our own flowers using organic best practices. Whereas most flowers bought in the U.S. are imported from overseas, our flowers move from our field to your home in a few hours. By keeping it local, you get higher quality flowers with longer vase lives. With designated pollinator species and no-till farming practices, we are committed to being a part of the solution to the climate crisis. We offer custom arrangements for weddings and special events. See our Wedding Flowers page for details. 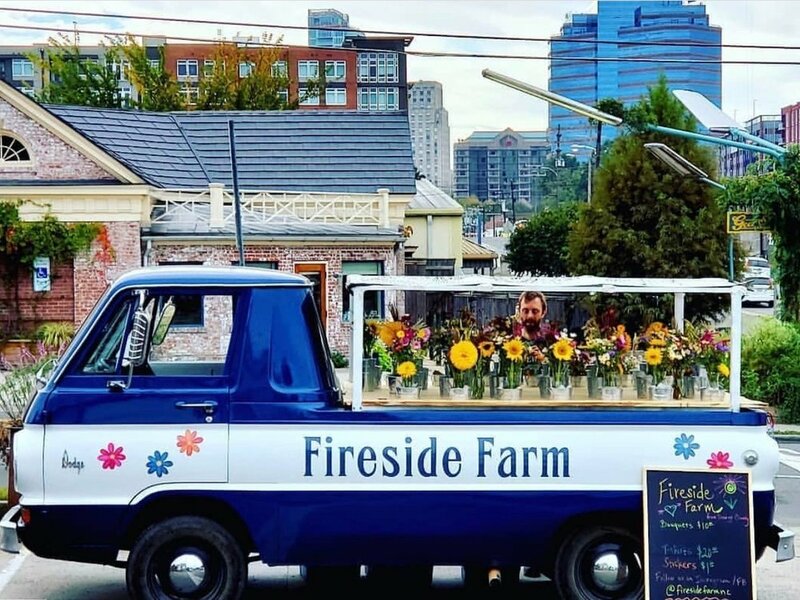 We sell flowers out of Sprout, our 1969 Dodge A100. Look for her at the Geer Street Cocoa Cinnamon on Saturday mornings— and at area music/outdoor festivals. We sell our seasonal flowers by the bucket. Orders can be picked up at the farm or delivered in the Durham-Chapel Hill area. We love to setup bouquet-making bars and flower installations for special events.